The Women’s Murder Club has busted some pretty nasty criminals in their day, but the serial killer terrorizing San Francisco in The 9th Judgment is probably the worst they’ve ever seen. Dubbed the “lipstick killer” because of the messages he leaves at crime scenes, the sadistic psycho targets mothers and their young children. It’s a brutal scenario even for James Patterson. In contrast, the other case detective Lindsay Boxer and her partner, Rich Conklin, are working—trying to nab a cat burglar nicknamed Hello Kitty—seems almost light hearted. She steals jewelry from the rich and famous while they are having dinner parties and have turned off their security systems. These high profile cases have the city on edge, and Lindsay and Rich are under a lot of pressure to catch both criminals before they can strike again. 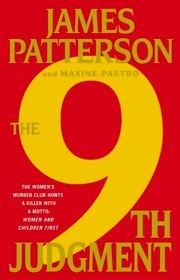 After nine books, the Women’s Murder Club series is still going strong and The 9th Judgment, with its short chapters and breathless writing, is a thrilling crime procedural. It focuses squarely on Lindsay and Rich, with less emphasis on other characters than in previous books. I think Patterson writes Lindsay, Claire, Cindy, and Yuki as realistic, well-rounded characters—they’re smart, brave, and tough, yet they’re also vulnerable. He seems to really get these women, however the Hello Kitty cat burglar—not so much. She’s driven to become a thief by her douchebag of a husband. Really? If she has the nerve to steal and fence jewelry, wouldn’t she have the nerve to, oh I don’t know, leave the abusive jerk? You’re probably saying, duh, everyone who has ever read a Sidney Sheldon novel knows women only turn to crime when they’ve been wronged by the men they love. So anyway, between that tired cliché, the over-the-top violence, and a really random epilogue, I wouldn’t say this is a perfect book by any means. Still, I enjoyed watching both the major storylines unfold and seeing how Lindsay would outsmart the bad guys. I listened to the audiobook version of The 9th Judgment, which is narrated by the talented Carolyn McCormick. She perfectly voices Lindsay and the other characters. The 9th Judgment isn’t exactly great literature, but I enjoyed it for what it is, and found the audiobook to be the perfect distraction to make my time on the treadmill go by faster.